My annual pilgrimage to the Monterey Jazz Festival started off a little different. I had stopped at a friend’s house to pickup my digital recorder. I got back in my car and it would not start…dead! I called AAA and they came out and pronounced my battery dead. Average car battery life is 3-5 years and my battery was almost 5 years old. David from the AAA dispatch service sold me a brand new battery right on the spot and I was back on the road again. Thank you David and AAA! I arrived safely in Monterey just before 6pm, checked into my hotel and went to the festival. I initially went without my cameras so I could get my press credentials, festival gear, and some dinner. Typically, Friday evening starts off really mellow and picks up as people arrive throughout the evening. 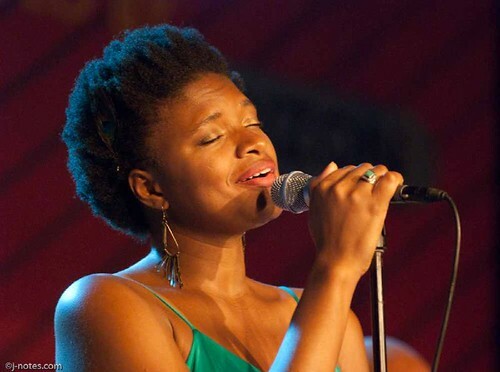 My first show for Friday evening was singer Lizz Wright in Dizzy’s Den, She looked radiant and sounded phenomenal. This was her first visit to Monterey since her debut performance here in 2002 which was also my first visit to Monterey. It is always amazing to watch an artist grow and develop over the years. It’s a joy to see Lizz as she brings something new to every performance. Whether it is a nuance, a turn of phrase or just bringing her life experience, her rich vocals captivates her audience. Her set included a smoldering rendition of “I Idolize You,” “Hey Mann” a gospel/bluesy “Walk With Me,” “Blue Rose,” “Another Angel,” and “Coming Home.” She melted us with “Dreaming Wide Awake” and closed out the evening with “Thank You.” We showed our gratitude with standing ovations. Her wonderful band included David Cook on keys, Robin Mactangay on guitars, Nicholas D’Amato on bass, and Brannen Temple on drums. I stopped in the Night Club, where the John Patitucci Trio was on a serious groove with John on bass, Joe Lovano on tenor sax and Brian Blade on drums. I went back to Dizzy’s Den to witness the incredible singer/bassist Esperanza Spalding and her band. This was a hot show as there were lines waiting outside to get in. I closed out the evening in the Coffee House Gallery with 23 year old New Orleans pianist Jonathan Batiste and his quintet. I came in on a composition that included a nod to “Surrey With The Fringe On Top” and Jonathan on vocals. Next, he played a composition that alternated seamlessly between a ragtime/stride piano rhythm and a straight ahead rhythm. He was truly spellbinding and just incredible to watch. There is more great music ahead for the weekend. There are still tickets available. For more information, www.montereyjazzfestival.org. This entry was posted on Saturday, September 19th, 2009 at 1:34 pm. It is filed under Community, Concert Reviews, Monterey Jazz Festival and tagged with Brian Blade, Esperanza Spalding, jazz, Joe Lovano, John Patitucci, Jonathan Batiste, Lizz Wright, Monterey Jazz Festival. You can follow any responses to this entry through the RSS 2.0 feed.